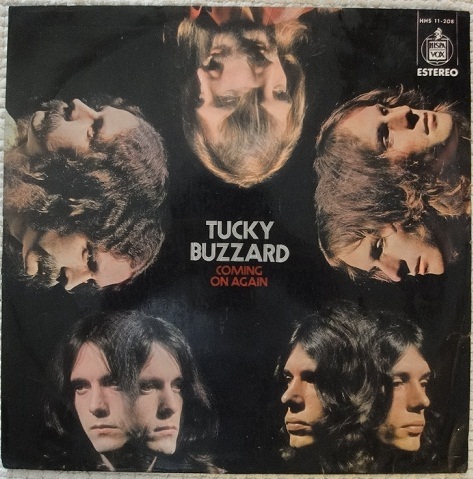 Tucky Buzzard were a British hard rock band formed in 1969 by three former members of The End. The original lineup was Jimmy Henderson (vocals), Terry Taylor (guitar), David Brown (bass), Paul Francis (drums), and Nick Graham (keyboards). Halfway through recording their debut album, Frances departed from the band and was replaced by Chris Johnson, who recorded the remaining drum parts and was credited on the album sleeve. Tucky Buzzard produced a total of five albums between 1969 and 1973. The band’s producer was Bill Wyman of the Rolling Stones. Terry Taylor has worked on a number of musical compositions with Bill Wyman and has played with him in a number of his bands, Willy and The Poor Boys, Bill Wyman’s Rhythm Kings, since he left The Rolling Stones. In 2006 Tucky Buzzard was featured in an article called Top 6 Classic Rock Bands You Never Knew You Didn’t Know written by Dave White.